So my Dad arrived to Tbilisi mid week....yippee our first visitor!! So just as he was nearly over his jet lag, I woke him up at 2 something in the morning to catch a flight at 4:55 in the morning to Warsaw....just cause I'm sweet like that. The benefit of the majority of Tbilisi's flights arriving/departing between 3 and 6 am is that when you arrive at your destination you have a full day to sightsee. 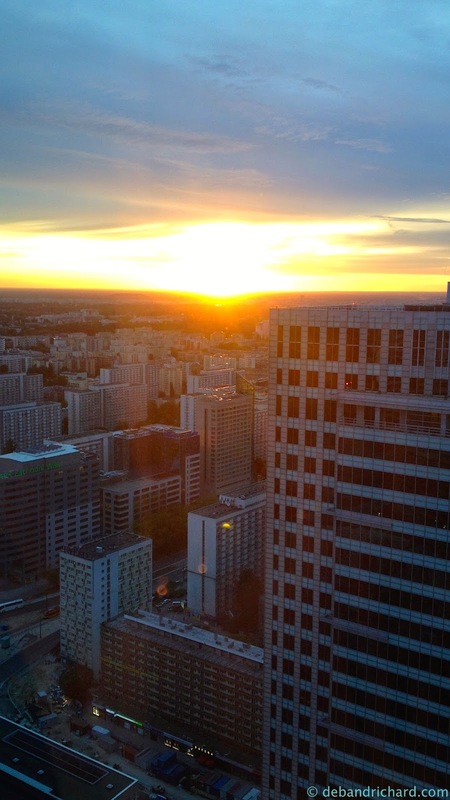 We arrived in Warsaw a little before 7 am (and our departing flight left at 10:40 pm), so we had 3 full days of sight seeing (prepare for the photo overload). Since my Dad was on this side of the pond, it seemed like the opportune time to visit where his grandparents grew up and moved away from. All 4 of his grandparents hailed from different small villages about 2 hours (in different directions) from Warsaw....so we opted to not rent a car and get lost in the countryside. After dropping off our luggage we had some breakfast at a little bakery (it was 8ish in the morning and the Starbucks down from our hotel was not open yet.....what?!?!?). 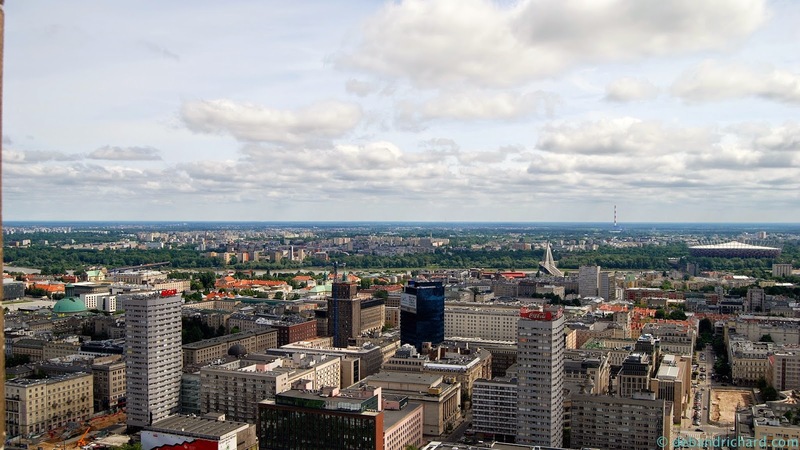 After breakfast we signed up for a tour with Warsaw City Tours. The concierge recommended this tour over the off/on buses. The Mercedes sprinter would pick us up from the hotel and walk with/talk to us at different sites where as the double decker on/off would just drop us off and pick us up 2 hours later. So off we went with the tour. Our guide spoke English but talked so quickly (throwing in Polish names and places) I was a bit lost a first but after a while he got much easier to understand. On our way to the Royal Park I was looking out the window and say a bunch of signs with landscapes from different American National Parks....it took me a second and then the lightbulb popped on....US Embassy. 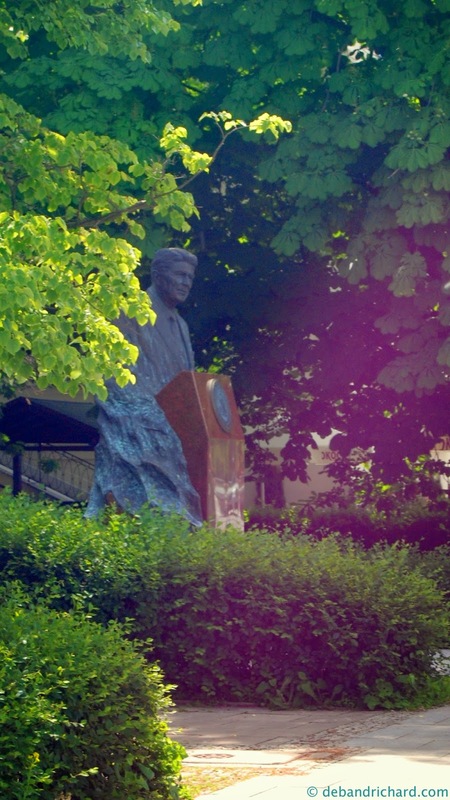 Directly across from the US Embassy is the Ronald Reagan Monument, for all his work he did to end communism. (At times it was interesting when our guide talked about different battles and invasions; how around nearly the same times Georgia was battling similar battles). 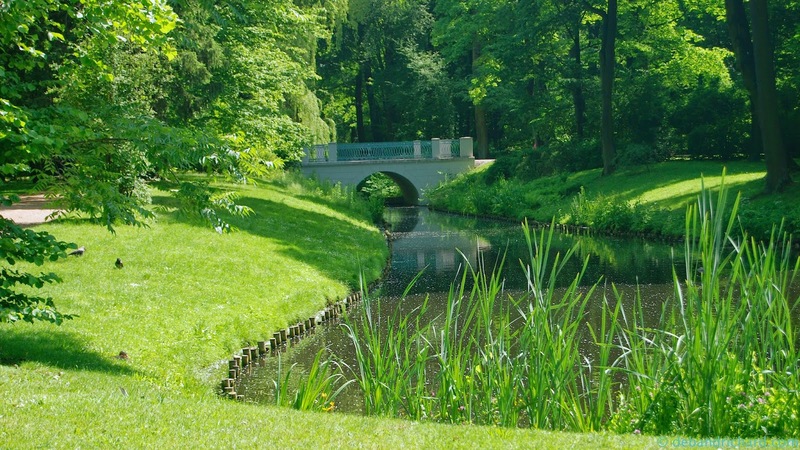 Next we entered the Łazienki Park, the largest green space in the city of Warsaw. 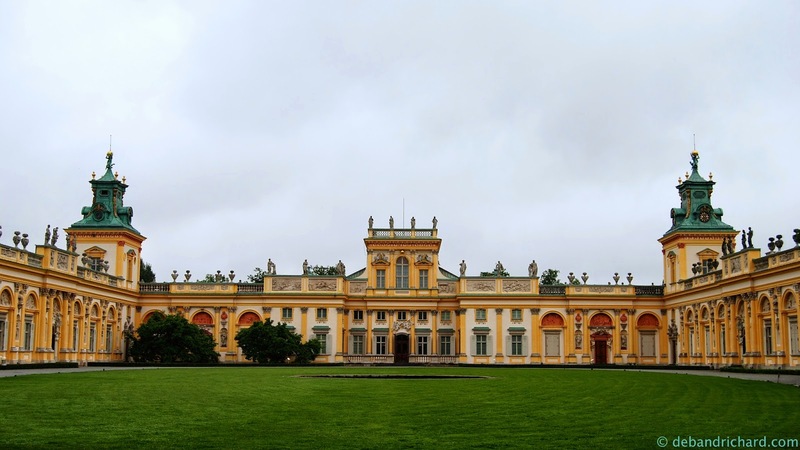 It houses the Royal Baths, a statue of Chopin, backs up to Belweder, and is the site of the Floating Palace. We saw lots of ducks and some feisty squirrels. The squirrels had little tufts of fur above the ears and they ran in a hopping manner. Unfortunately they were too quick for me to get a decent shot (but one did climb up our tour guide's leg!). At the entrance we went in, there was a statue of Frederick Chopin, the famous Polish composer. He was a child when he began playing the piano (our guide said 8 years old!) at Belweder for the Duke. 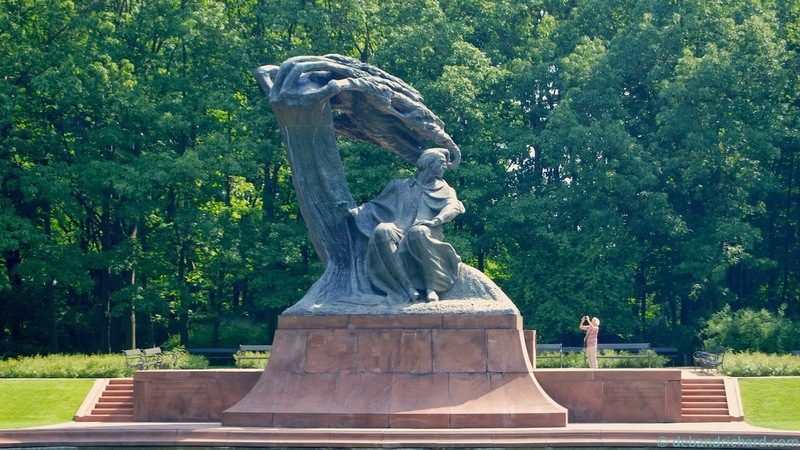 The statue was built showing him under a weeping willow tree (and every Sunday during warm weather there are free piano concerts in the park around the statue). Around the city there are numerous Chopin benches. These benches play some of the pieces he had composed. Next we walked through the park to see Belweder. 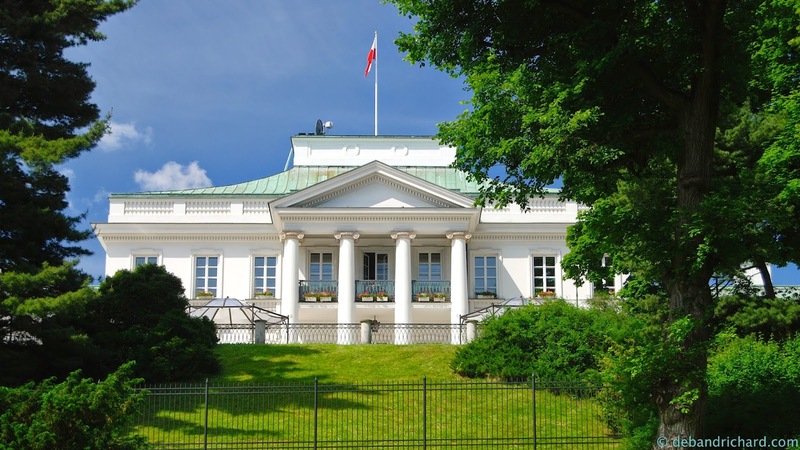 This is where the current President (Bronisław Komorowski) of the Republic of Poland resides. Our guide said some days you will see him in the backyard. And what white house (which was built in 1694, way before the US White House) photo would be complete without a 'hey we were here' shot? So our guide walked us over to another attraction in the park, the Palace on the Water. The Palace was originally a bath house for a nearby palace (hence the Royal Bath name), but was converted to private residence in the late 1700s. The palace sits on a little man-made island in the center of a lake. There were lots of statues and an open air theater that gave it a very Roman-architecture feel. You can play 'where's Tom?' in this picture of the the theater. 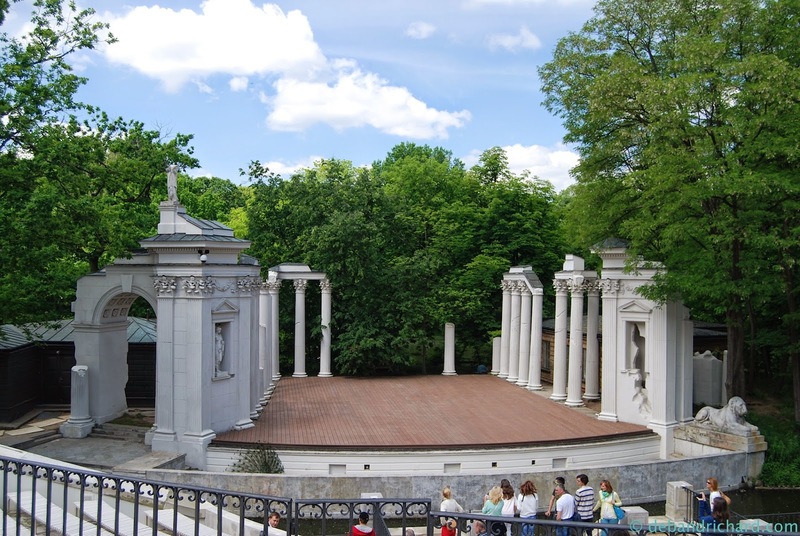 It was built as an imitation of a Roman theater....in fact the statue to the left with the missing head and the broken columns were built "broken". A sad (but interesting) thing our guide pointed out was where the German invaders had cut holes into the walls. 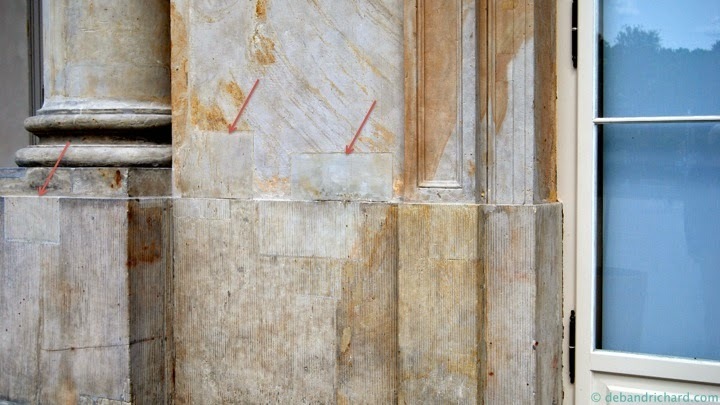 They had intended to insert dynamite into the holes and blow the building up, but someone misplaced the dynamite so they just used the holes to set fire to the palace. While everything was destroyed inside, the structure survived the fire (and the war). On the way out of the park, we passed Poniatowski's coat of arms. 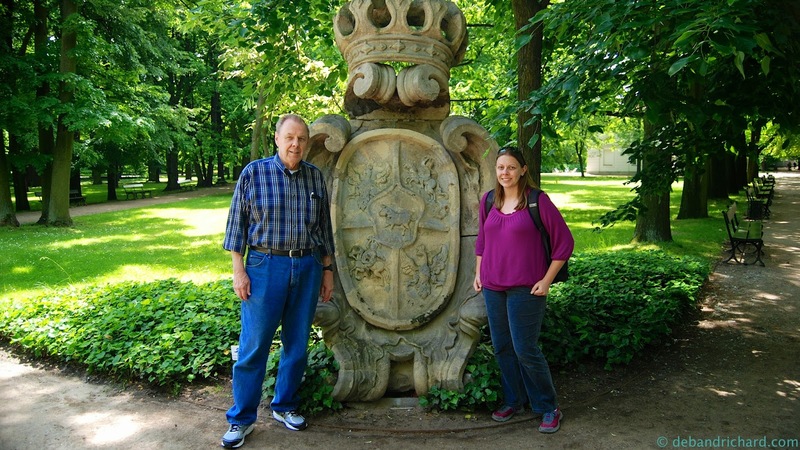 Our guide told us that the four outer images signified the historical Poland coat of arms (two crowned eagle and two knights on horses) and the inner image change with each king. 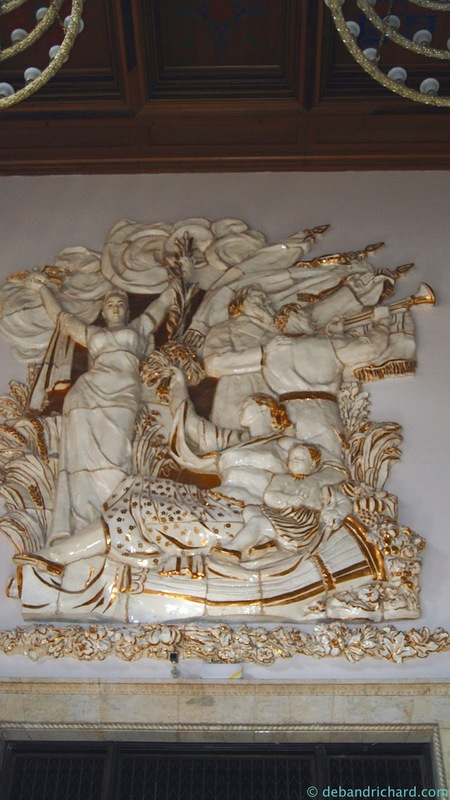 King Poniatowski was the last king before Russia took over in the late 1700s and therefore his family crest of a bull remains in the center. 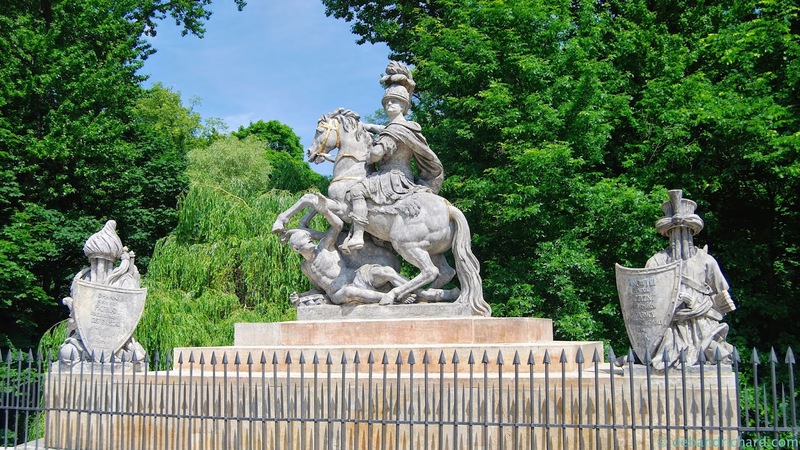 Outside the park, we walked over to the Statue of Jan III Sobieski. King Jan III fought the Ottoman Turks back in the late 17th century. (Note: we visit the King's summer palace later during our trip). By this point, our tour bus had drove around the outside of the park and met back up with us. We drove along the Royal Route to the Old Town. Along the way, our guide pointed out many interesting buildings and monuments. We also drove by a ton of different embassies. At the beginning our guide ask where everyone in the group was from. He made sure to draw attention to everyone's personal embassy. We drove past the round St. Aleksander's Church. 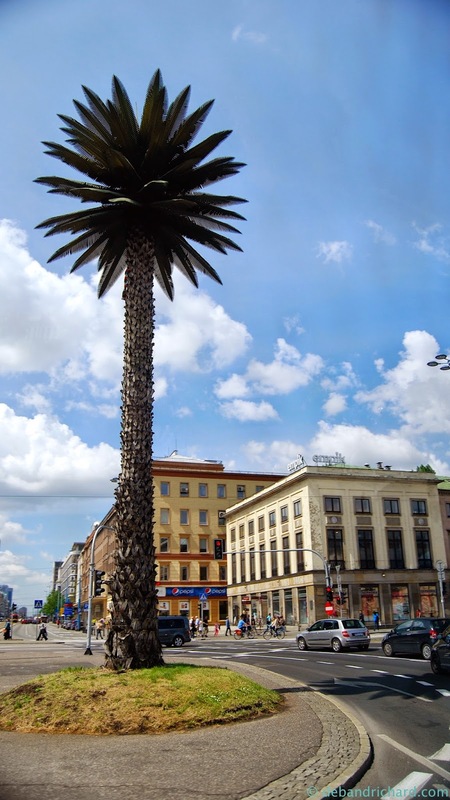 We also drove past a 50 foot palm tree on Jerusalem Avenue. In the 18th century this was a Jewish neighborhood. It looks surprisingly life-like even though it is made of metal and plastic and is meant to look like a tree one would see in Jerusalem. We then drove to the Jewish Ghetto. It is just heart-wrenching to hear stories of how poor the people living in the ghetto were. They were told to get on train that would take them to a place they could work. They had hope when they boarded the train, but it quickly turned when they were taken to gas chambers. An image of right after the war showed the Jewish Ghetto was completely flattened. 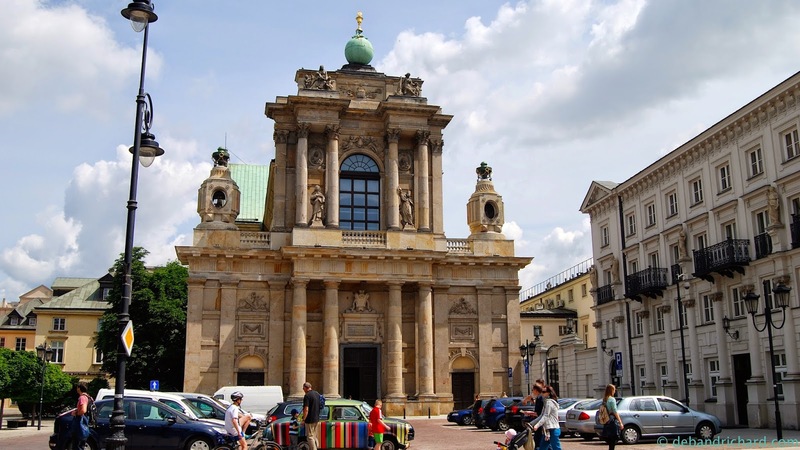 Every building but one church that was used by Nazi soldiers was destroyed. 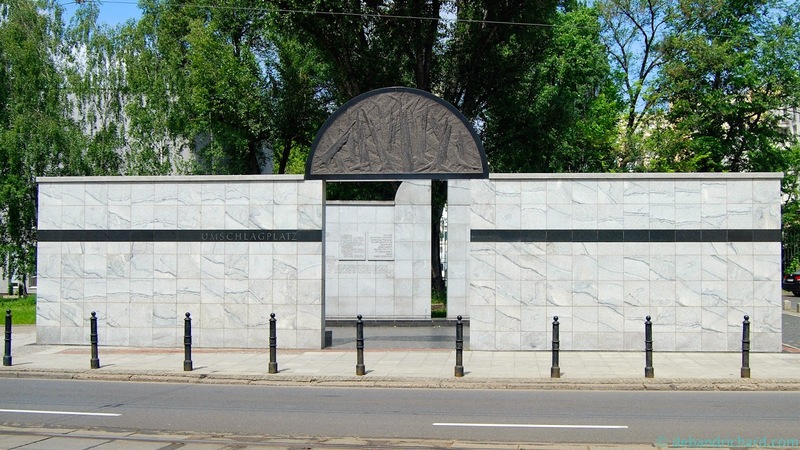 This monument is located where the Jews assembled to board the trains. Once we arrived at our Old Town stop, the first place we visited was one of two buildings that pretty much survived WWII. 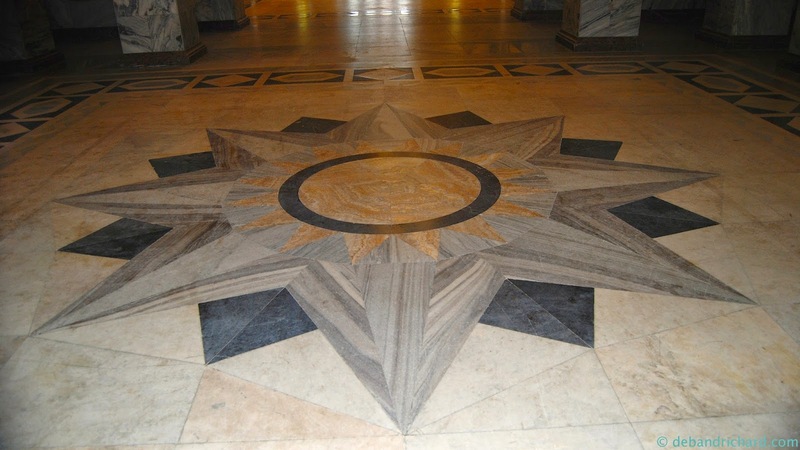 The first building was the Presidential Palace. We happened upon when they were having a honor guard ceremony (so I didn't take photos of the palace, but I snapped a few of the guards and then enjoyed the synchronicity of their movements). After their demonstration, the guards marched into the palace. A few minutes later they returned and marched past us. They will march all the way to the Tomb of the Unknown Solider, do the changing of the guards there, then march back to the palace. 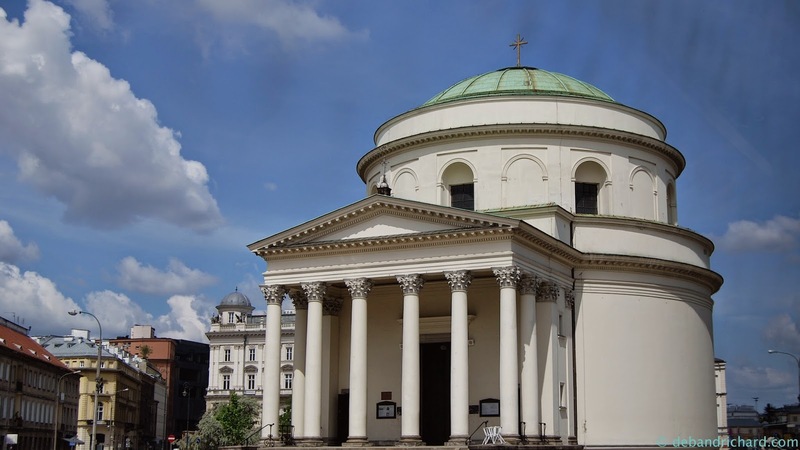 The second building spared was the Church of the Assumption of the Virgin Mary and of St. Joseph (also called Carmelite Church). Only one side of this church was destroyed during the war. In several spots around Old Town, they had photos taken of the area prior to WWII and photos taken after WWII before rebuilding. You can compare how well of a job they did rebuilding the city. It was some of the oldest looking, new buildings I've ever seen (only about 50 years old or so). This is from one of those viewpoints. 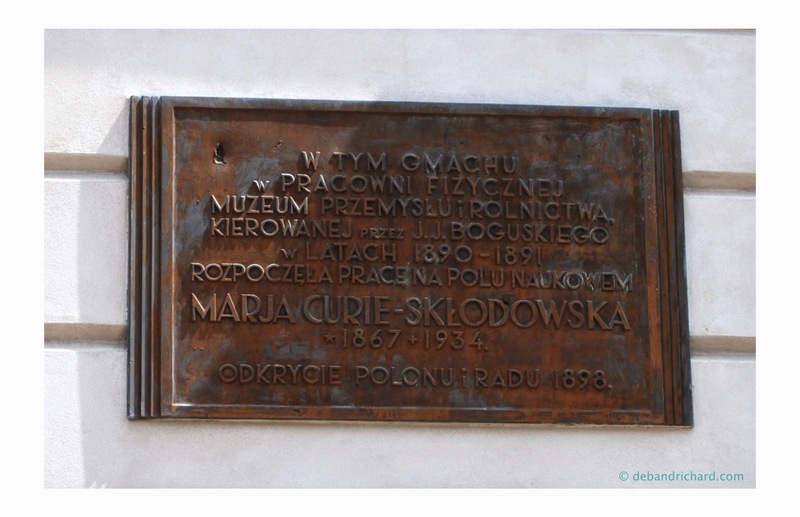 We did not go to the Marie Curie museum, but we saw many signs about her around town.....never put this one together but Polonium is named after Poland (Curium, Einsteinium and Californium were easy to correlate). 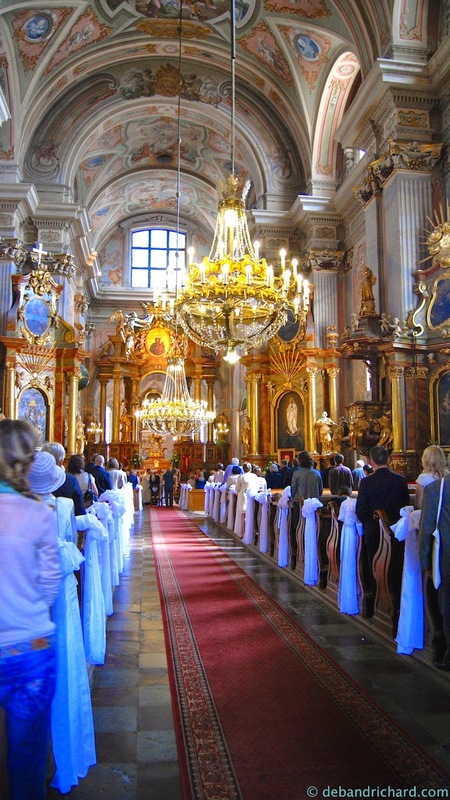 Our guide took us into St. Anne's Church, but we didn't go in very far....we were crashing a wedding! Ooops, but they had to know that would happen. It was odd to see a Catholic Church without stained glass windows everywhere. As we were about to cross where the defensive walls from the 1500s once stood, we passed the King Zygmunt III Waza Column. 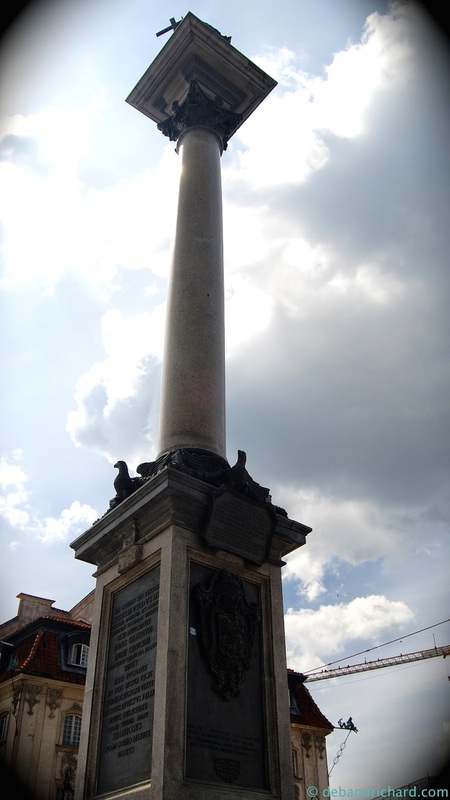 The column was originally raised in the mid 1600s. During WWII, it was destroyed. They rebuilt a new column/replica, but the original column still lies where it fell during the war (it is in two pieces behind the scaffolding). Colorful street in old town. Times of all the services on Sundays at St. John's Cathedral (one of about a half dozen Catholic churches in a one-mile radius). There is no excuse here for not having a good time to go to church on Sunday...lol. 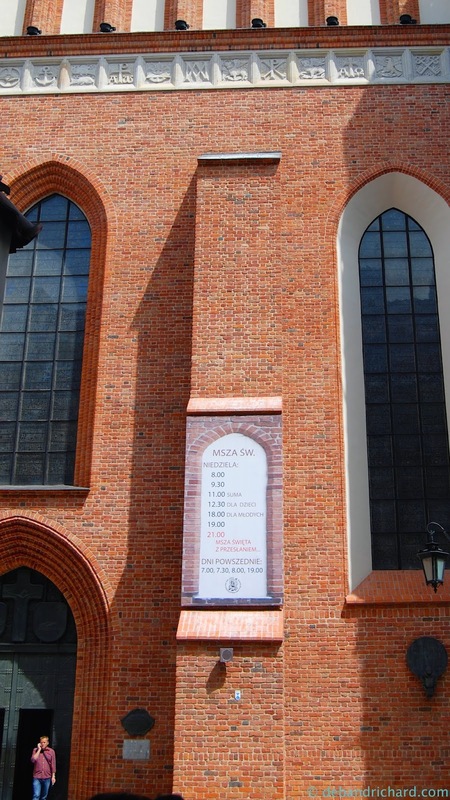 Our guide even joked that Poland's number one export is Catholic Priests. 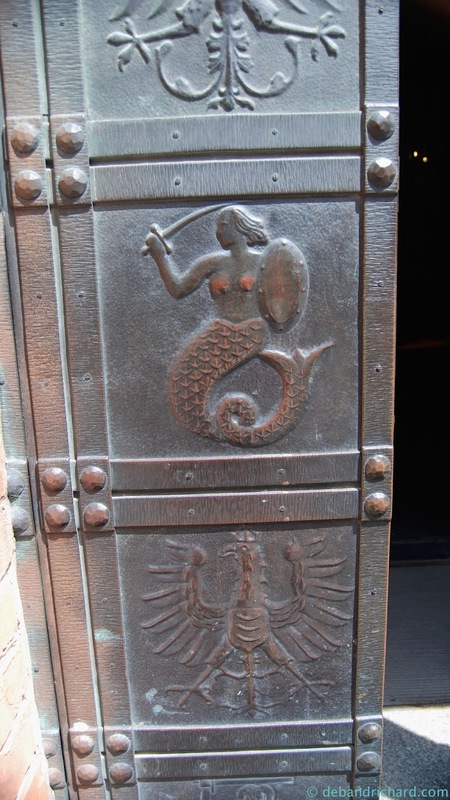 The doors to St. John's Cathedral had the Polish Coat of Arms and the Warsaw Mermaid on it. 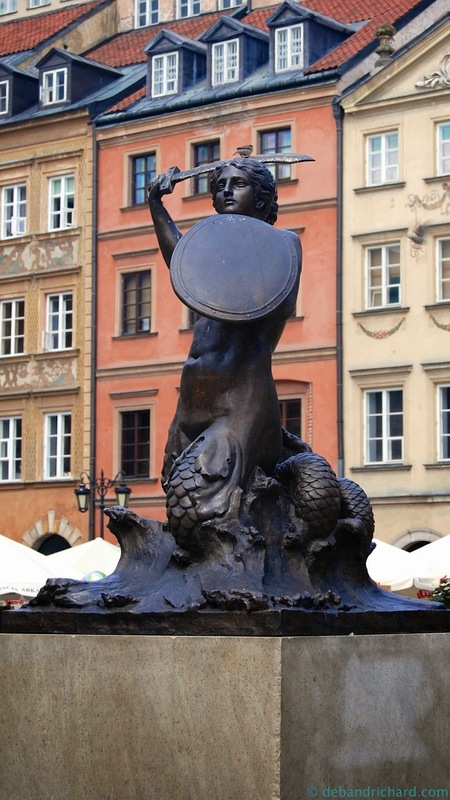 In the center of Old Town, is one of several mermaid sculptures. 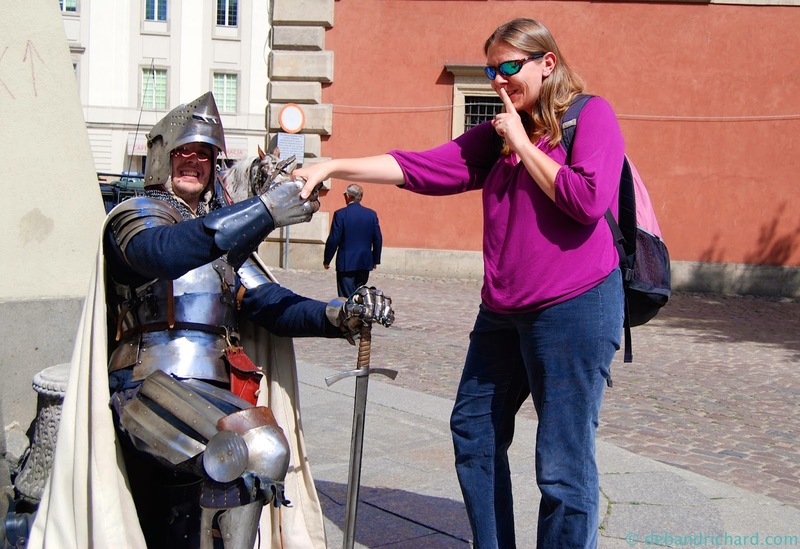 Ssshhhh, don't tell Richard I met a knight in shining armour. After having lunch and doing some shopping in Old Town, we began the trek back to our hotel. 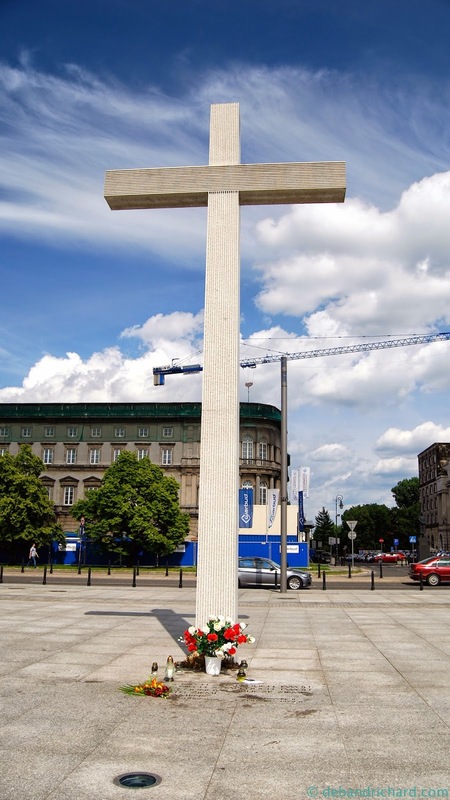 We came across the 9m tall cross to honor Pope John Paul's first visit to Warsaw after becoming a Pope. 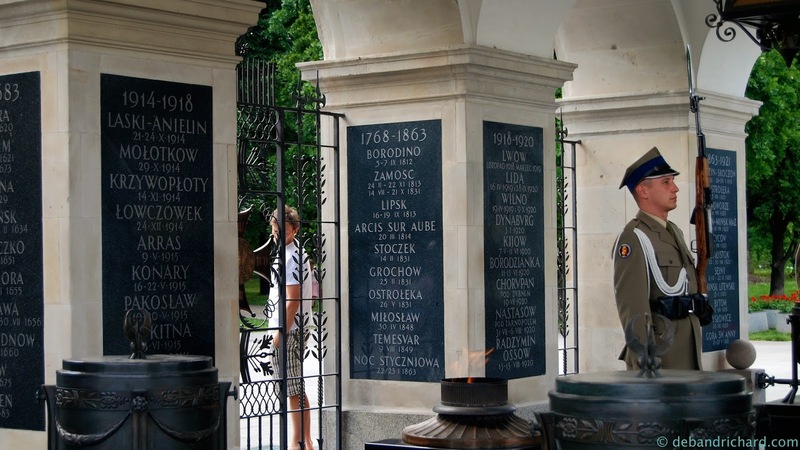 The inscription in Polish is a line from one of his sermon's. 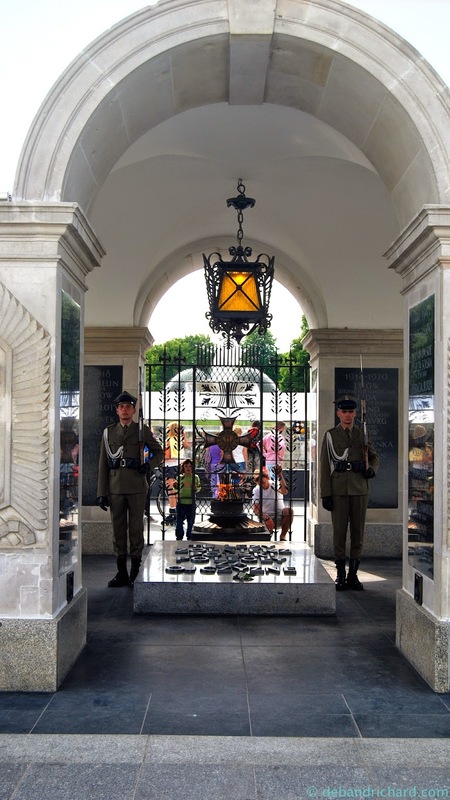 Across the courtyard is the Tomb of the Unknown Soldier. 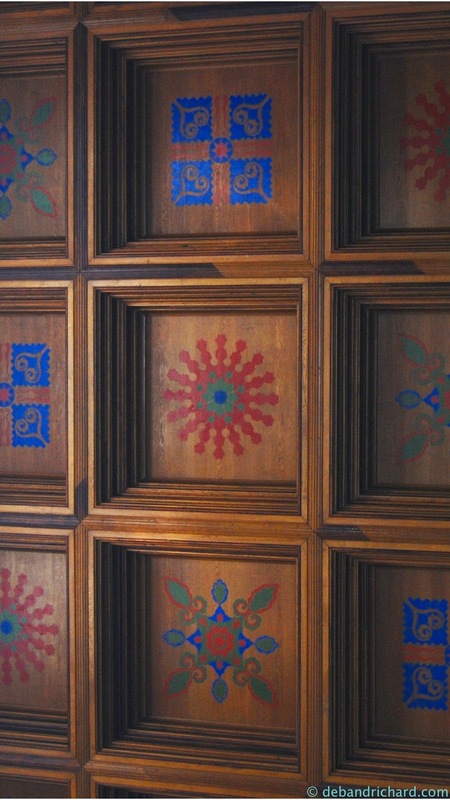 The tomb was once part of Saxon Palace which was destroyed in the war. 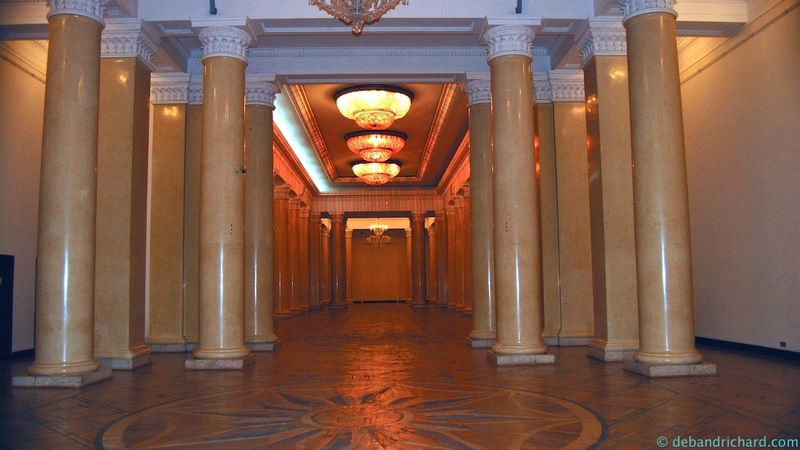 It is a tad eerie that the only part of the palace that survive the dynamiting was the tomb! Ashes from WWII soldiers have also been added to the tomb. 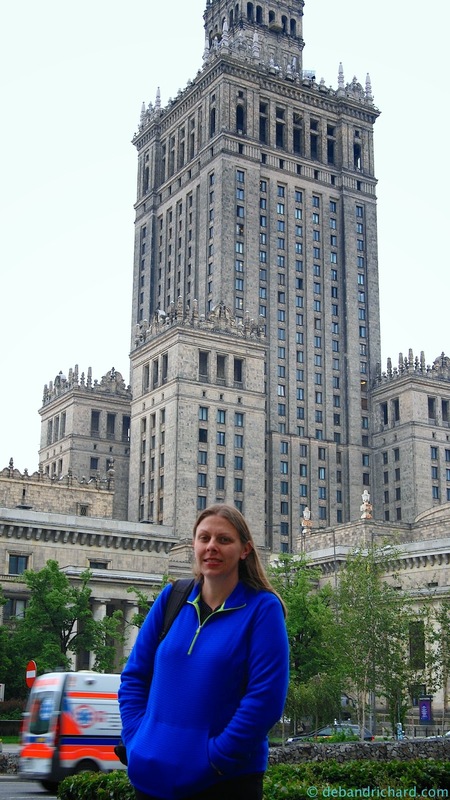 The next day, we headed across the street to the Palace of Culture and Science. I liked how the the In Your Pocket guide (which I downloaded to plan our trip, as well as, used to supplement my memory while writing this post), describes the palace as an 'elephant in lacy underpants'. 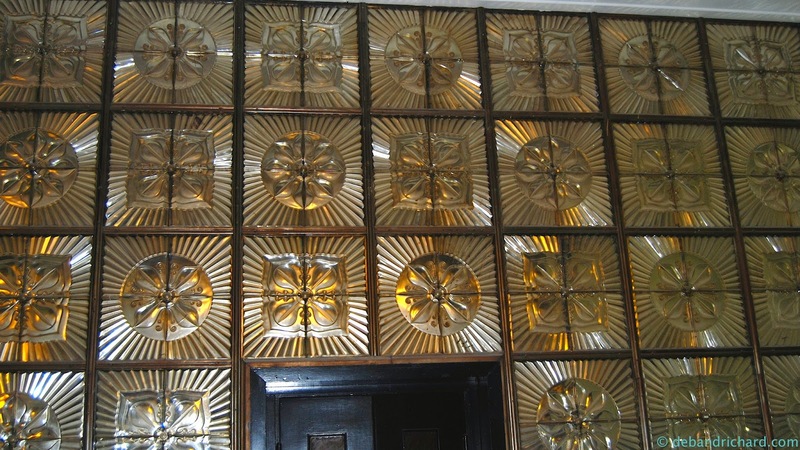 It is just so giant, you can see it from nearly everywhere, and it is overly ornate. 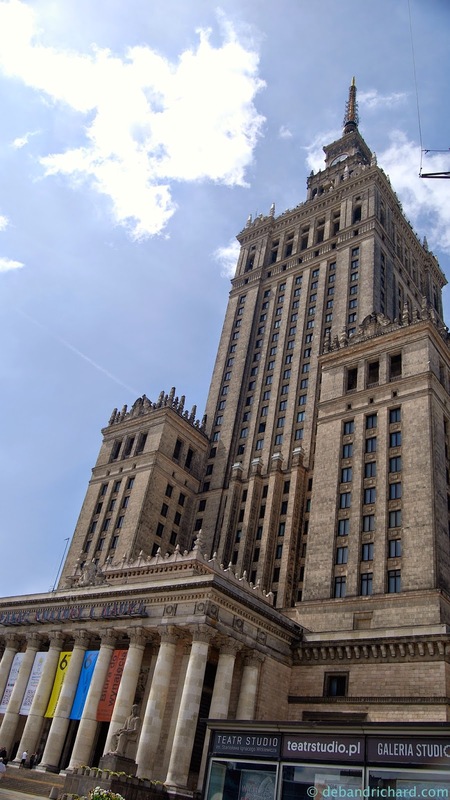 It was Stalin's gift to Warsaw (but he died before it was ever complete) and many Poles just don't like what it stood for. 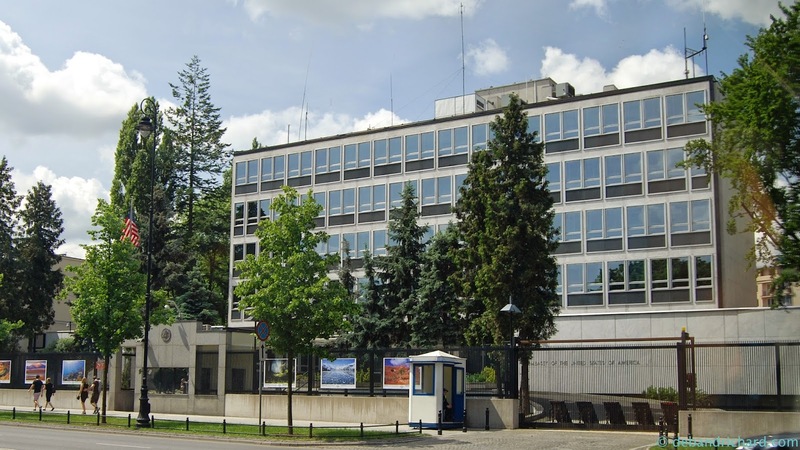 It is mainly an office building, there is an observation deck you can visit, there is movie theatre, a museum, as well as, conference rooms and such. 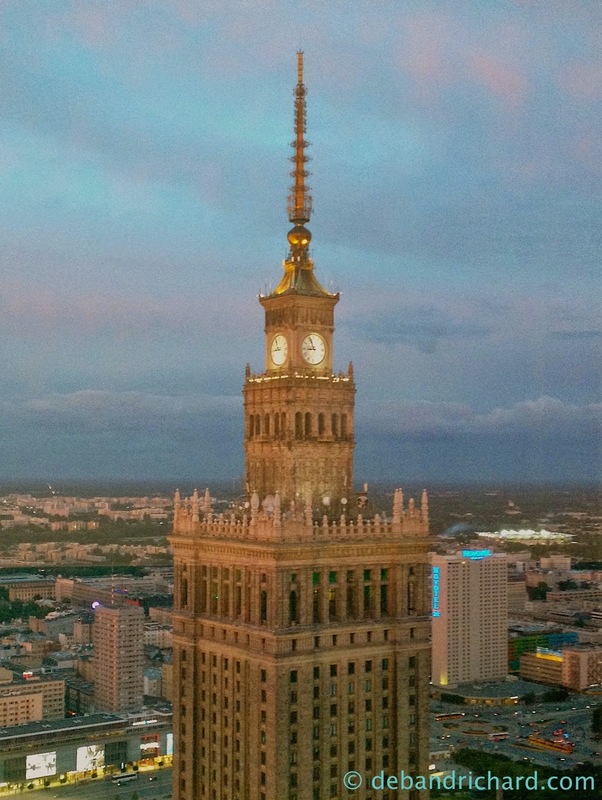 We went to the observation deck and many Poles describe it as the best view of the city because you can't see the Palace itself...lol. 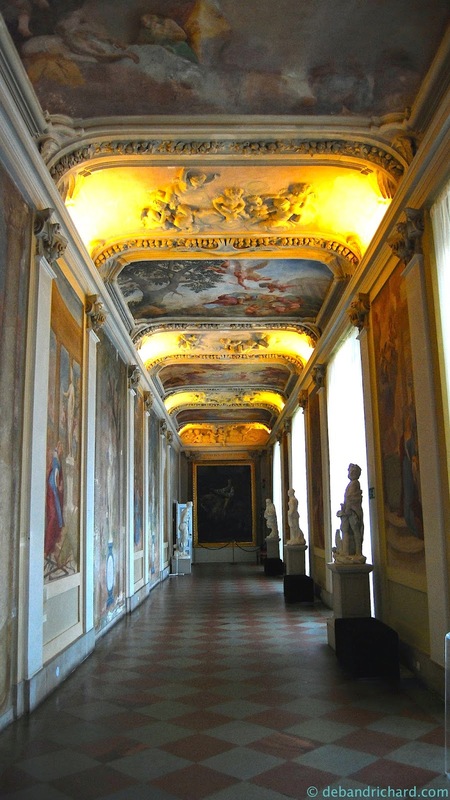 We wandered around the first few floors (not sure if we were suppose to or not) but it was maze of giant rooms and halls, most of which were empty and in need of repair. Definitely seems like a lot of wasted space and resources. There was also a lot of mirroring between the two sides. 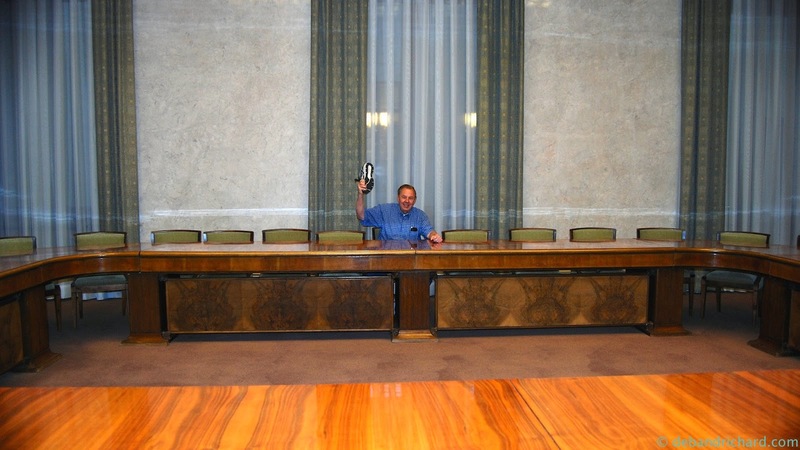 Dad decided to reenact Nikita Khrushchev's 'shoe banging on the table tantrum during a United Nations meeting' at a random overly large conference room table we happened upon. We attempted the Warsaw Ethnographic museum. It said it housed a exhibit of rural Poland folk art/life. We wandered around (they had some big event going on and it was a little crazy) but couldn't find the said exhibit we were looking for. 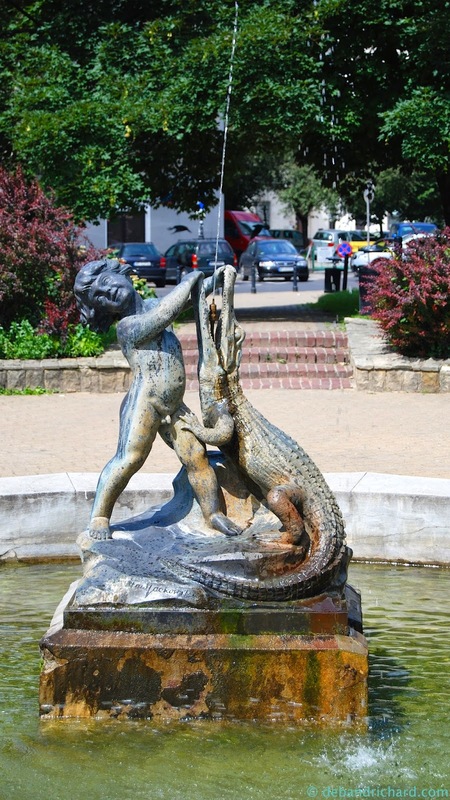 On the way, we came across a random boy with crocodile sculpture....we were not sure of the significance and I'm fairly certain there aren't crocodiles in Poland. That afternoon, Dad rested from all the walking I was making him do and I indulge in some first world retail therapy at the mall! 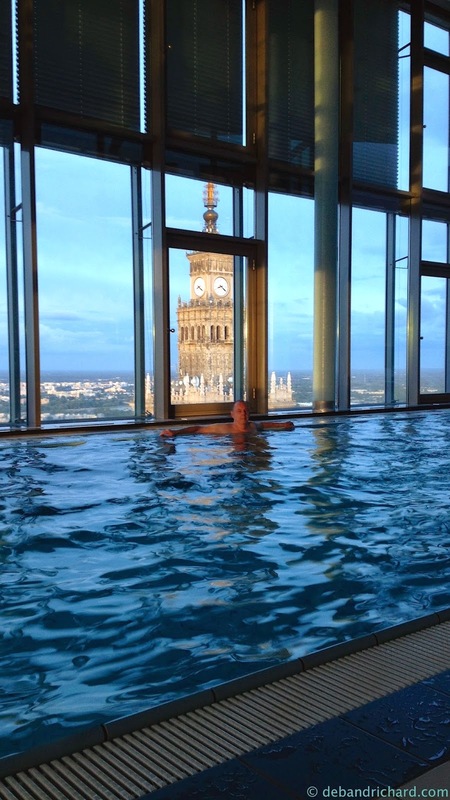 In the evenings, we enjoyed the pool on our hotel's 43rd floor. We especially enjoyed the views and the sunsets. 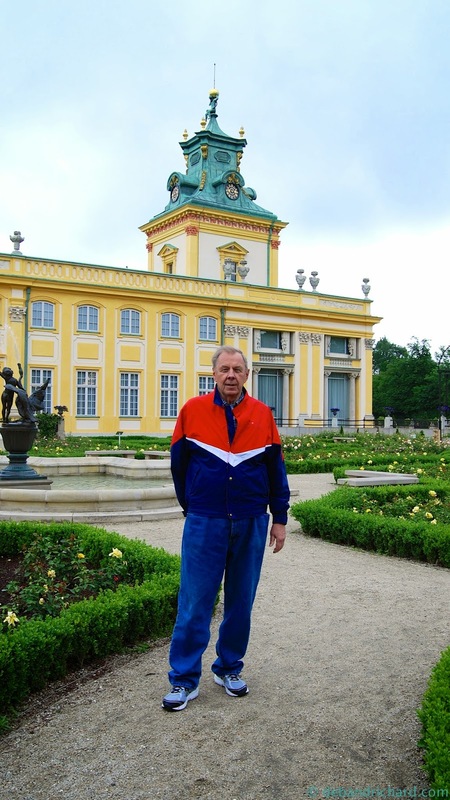 On our last day, we took a city bus out to the Wilanów Palace. The palace and its grounds were one of the few places that was not destroyed in the war. (This seemed like a much more authentic place to visit than the Royal Palace which was completely rebuilt to replicate the original palace). 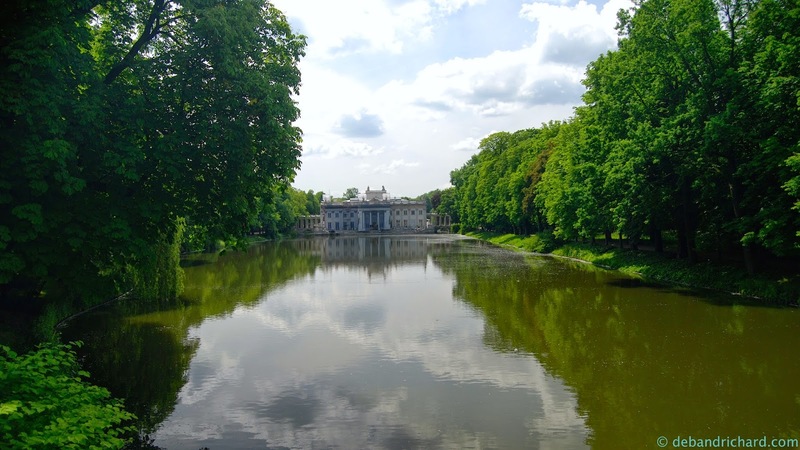 Wilanów Palace is a late 17th century palace built as a country retreat for King Jan III Sobieski. Quite the summer cottage as you can see. It was a rainy day when we visited, I recommend going on a sunny day. Flash photography was not allowed and it was just too dark to get many decent photos inside. 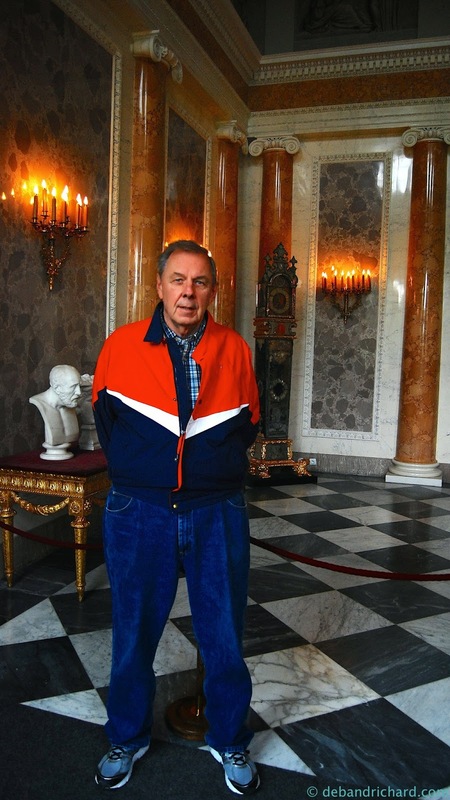 Dad in front of a grandfather clock. 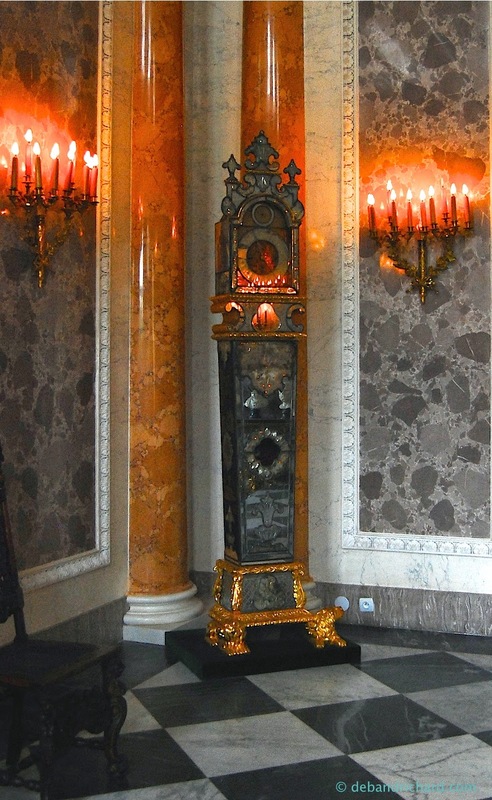 The clock had lots of sparkly stones as decoration (sigh, too many princess movies/all things girly, I describe things as sparkly now). 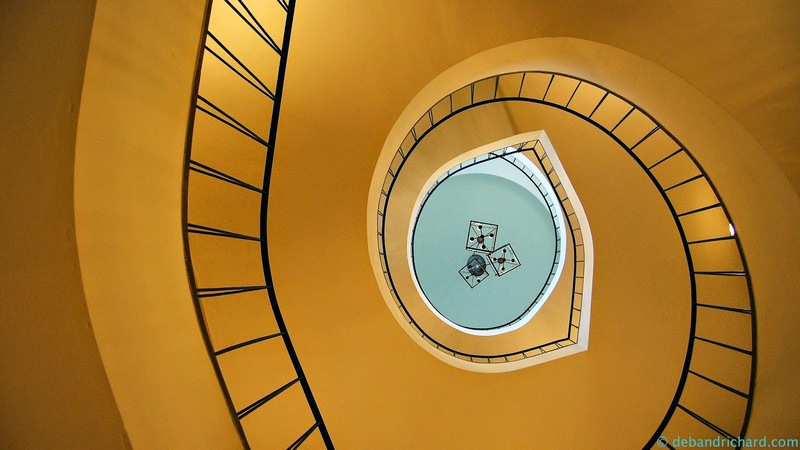 Awesome spiral staircase (and luckily the tour walks you down instead of up the staircase). We didn't pay for a tour guide. In nearly every room there was a small card with descriptions. In fact there were several cards in each room in a variety of languages, we always grabbed the one with the British flag on top. 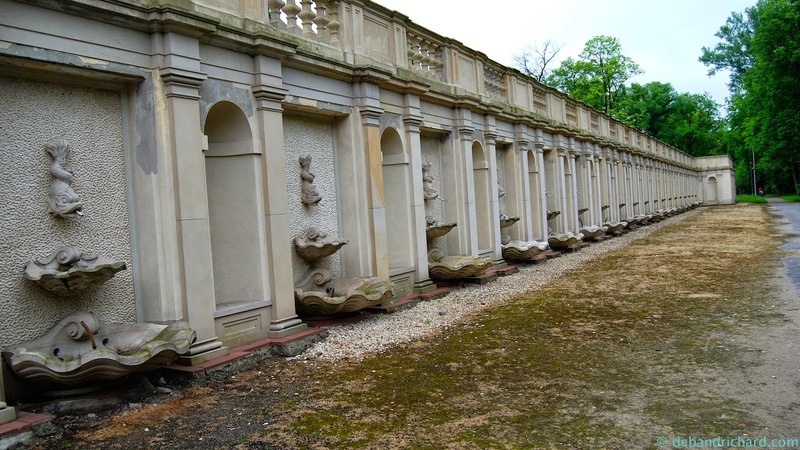 This wall in the garden would be such a sight to see when all the fountains are working! 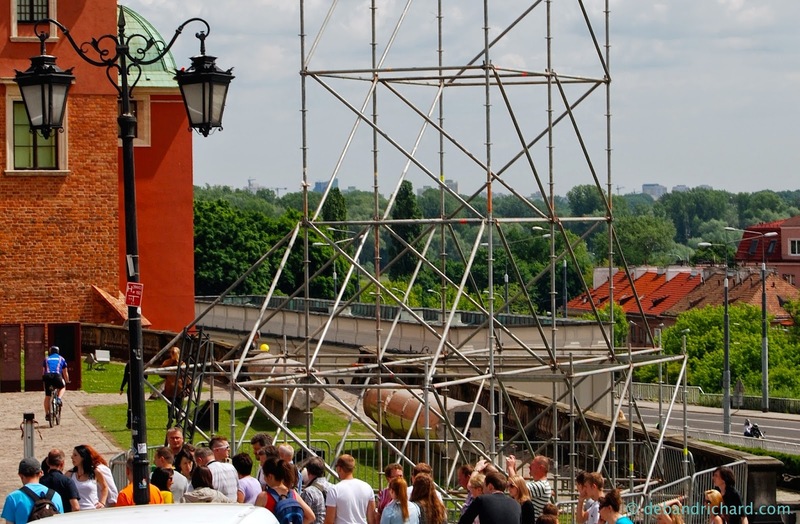 We walked down to the Vistula River which the back of the gardens backed up to. 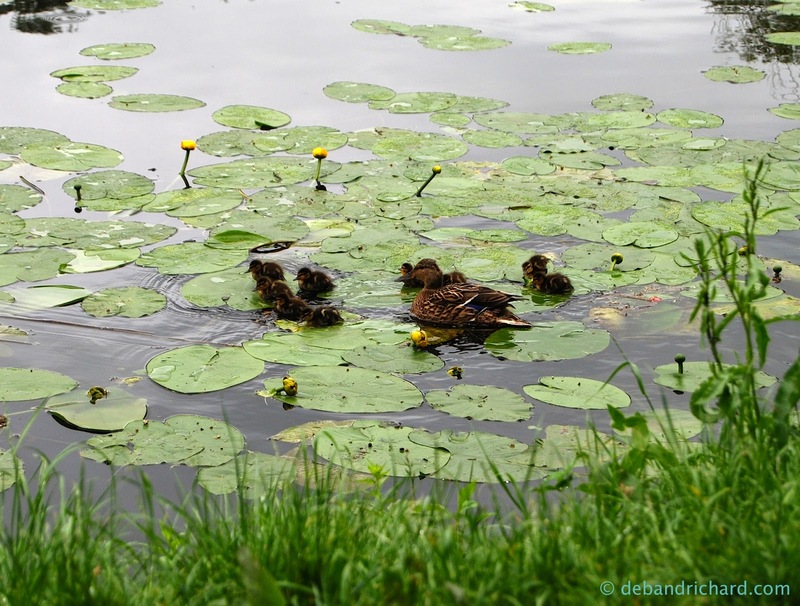 We saw a mother duck with her nine little ducklings! We returned to the rose garden portion of the Palace gardens. Before departing, we grabbed one last shot of the Palace of Culture and Science and then left for the airport to catch our 22:40 flight back to Tbilisi. My dad and I both enjoyed our visit to the home country of our ancestors. It was quite fun seeing doppelgangers for different great-aunts/uncles. I was amazed at how many blue-eyed Poles we saw (in fact I think I only saw one other person with green/hazel eyes like me), it totally throws off those proportions from biology class. Most of our ancestors had left prior to WWI, so I know the city looked completely different than they ever saw. Maybe one day we will visit Krakow and get the smaller town feel that they probably experienced.